A little oyster named Blue lay on the white sand of the ocean floor. Her shell sparkled against the silent waters of the sea. Far above, she could see Sun, a bright, golden pearl in the sky. 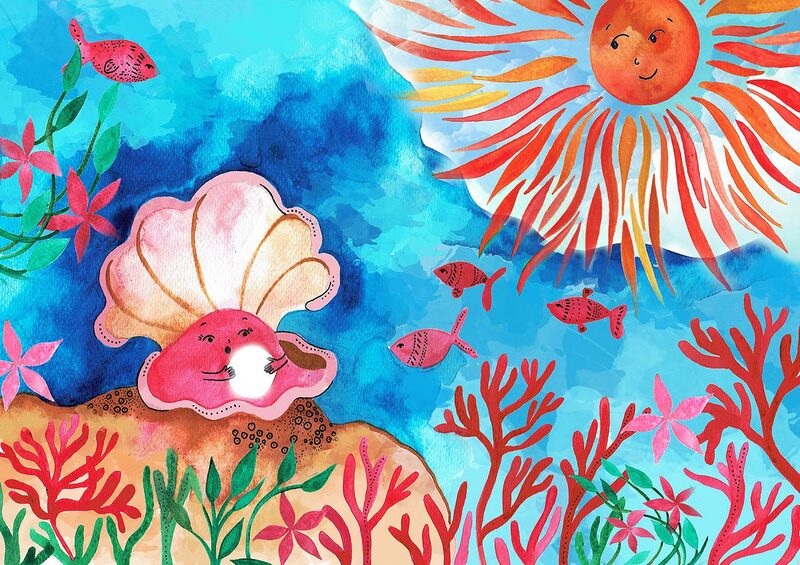 Sun’s rays shone down through the water and warmed the little oyster’s shell. Fishes swam by on their way to see the world. Blue did not call out to them or join them. She wished she could visit faraway places like the fishes, but she could not swim for she did not have fins. Blue was alone inside her shell, but her friend Sun was usually somewhere around, so she was content. Inside Blue’s shell, she kept her heart. Her heart was warm and soft. She often wondered why this was since her shell was very tough. When she was hungry she ate tiny plants that drifted by. When she was thirsty she drank water through her gills. One day, Blue was sleeping peacefully when something got under her shell. Night came. It was dark and cold at the bottom of the sea. Blue was very sad. She did not know what was making her heart hurt so much. She did not know how to make the bad thing go away. So she cried. Far above, the stars heard Blue crying and trembled in the sky. They looked down at Blue and pitied her. Blue wished they were not so far away, and for the first time, she felt lonely. As usual, she wondered where her friend Sun had gone. It was the longest, darkest night. The next day Sun came out again. The world was bright and beautiful just as before. Blue felt Sun’s warm rays on her shell. How glad she was! Now she felt brave. She gathered up all her strength and from inside her heart came some shiny, silky stuff called mother-of-pearl. It covered up the splinter in her heart so it didn’t hurt anymore. It made a smooth, pure pearl that shone like the moon. Blue was surprised by her new treasure. She wondered what to do with it, for it seemed too beautiful to keep to herself. She was sorry that she had no one to share her heart’s riches with. She knew she must guard her heart for it was very precious indeed. The day came when a shadow moved across the ocean floor. Blue thought it might be a shark swimming above her, but it wasn’t. It was a boat with two humans in it, a man and a child. The child got into the water and swam close to Blue. She was so scared she thought she would die, but the child was kind and did her no harm. When Blue saw this, she opened her shell and offered the child the beautiful pearl. The child took the pearl and swam off, happy with the gift. Blue was glad she had brought joy into the world, but now her treasure was gone, and her heart felt empty and cold. Suddenly, above in the sky, Sun smiled down at Blue. Sun’s rays shone straight through Blue’s shell until her heart was full with Sun’s soft, tender light. Now Blue knew why her heart was always so warm, that this was Sun’s doing. And she knew why her shell was tough, only to keep her precious heart safe. Blue was proud. She knew that whatever got under her shell and into her heart, she could turn into something beautiful. She might never get to see all the wonders of the ocean like the fishes, but she could do great things from her little corner of the sea. And her friend, Sun, would always be around to help. 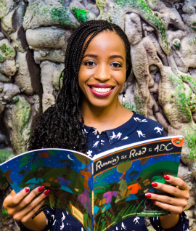 Summer Edward is the Foundress and Managing Editor of Anansesem Caribbean Children’s Literature ezine, a Highlights Foundation alumna, and a former judge of Africa’s Golden Baobab Prizes for children’s literature. Born and raised in Trinidad, she holds a Masters degree in Reading, Writing, Literacy from the University of Pennsylvania and is the recipient of the School of the Free Mind’s Way of the Book Honor Award granted to author-artists “demonstrating long and sincere commitment to changing the world through children’s books.” Her children’s writing and illustration appears in Whaleheart: Journey into the Night with Maya Christina Gonzalez and 23 Courageous ArtistAuthors edited by Pura Belpré Award winning author Maya Christina Gonzalez, on the Children’s Writer’s Guild website, and on Storybird.com where they have been viewed over 38,000 times. 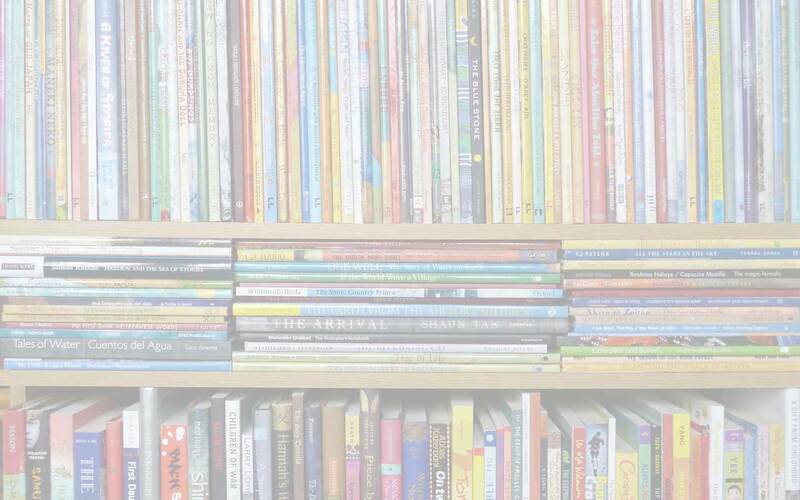 Her writings on multicultural children’s literature appear in Horn Book Magazine, WOW Stories: Connections from the Classroom, sx salon, Charlotte Huck’s Children’s Literature: A Brief Guide and more. She dons both writer and children’s editor hats and is currently working on her first picturebook manuscripts. You can learn more at her personal website: www.summeredward.com. Diana Cojocaru is a Romanian artist based in Bucharest: view her online portfolio. The story ‘Blue’ is ©Summer Edward, 2016; the illustration is ©Diana Cojocaru, 2016; the photograph of Summer Edward is ©Kevin Falby, 2016: none may be reproduced without specific permission. Diana Cojocaru, original story, Summer Edward. Bookmark.